I met Lynn while working with Alan Collinge of the Student Loan Justice Organization. She too has been working with Alan to call attention to the plight of students who took loans out to pay for college and the mishandling by servicers of them. The first story is of an older man who took out a Parent Plus Loan for his daughter, who has since died, and he is paying off the loan through garnished Social Security checks. The second story is a time table and it is long. A younger person takes out a student loan for $10,000, graduates with a Bachelors degree, encounters many issues along the way, and works in the type of work which does not pay as well as many. The $10,000 debt turns into $30,000 over time. This is a well detailed story as told by Lynn a CPA. I plan to send this story to a few people I know to make a point. Monica’s story is one of most detailed accounts of student loan mischief and as close to fraud I have read. It is typical of what students face today. Obama took the student loan lending business away from commercial interests and kept it within the government. The only problem, he left the servicing of the loans to commercial interests, who are in it for the money, and prey on unknowing teenagers trying to go to college, and eventually a living. These loans have greater profitability in default and are impossible to escape unless a person is disabled or dead. Lynn Petrovich, CPA: In 2016, I prepared the return for an 80-year-old man who came into the tax clinic. He handed me his W-2 form which reported wages of $500 and a Social Security statement. He needed to file a tax return to obtain a refund of federal and state withholding reported on the W-2. While reviewing his Social Security statement, I noticed one-third of it was garnished. When I questioned him about this, he became very solemn, put his head down, and explained it was for an education loan taken out for his daughter “some time ago” to help her attend college. She had since died. Piecing together what he told me, I figured he took out a federal Parent Plus loan, had defaulted (before, during, or after his daughter’s illness and death), and didn’t know what to do. The default resulted in the garnishment of his Social Security, most likely without end for the rest of his life. There is not even an accounting of what is taken each year. Between 1984 and 1987 Monica took out $10,000 in student loans. Over the next 30 years she made payments totaling over $24,000, yet she still owes more than $3,000 on her loans. I first met Monica at a tax clinic in the early 2000s. As a CPA, I had been volunteering my time preparing tax returns pro bono on Saturdays during tax season. Monica and dozens of other taxpayers were waiting patiently to have their taxes prepared at this free clinic located at the Jersey Shore. When it was her turn, Monica brought her completed interview/intake form to my workstation. I looked over the information she had provided and asked a few follow-up questions, including if she had any student loan debt. She shifted in her seat and explained that she took out $10,000 in student loans when she was in college in the 1980s. She said that she has been doing her best to repay the loans since graduating but wasn’t really sure about how much she had repaid, how much of the principal she has knocked down, or how much she still owed. As a single person who rented, Monica needed all of the deductions to which she was entitled, so I encouraged her to get some specifics about her loans. She agreed to come back the following week with her student loan interest amount. I’ve prepared Monica’s taxes many times since that first meeting in the early 2000s. Each year, she provided statements from her loan servicers which reported student loan interest received. During the 2017 tax season, while preparing her return, I discovered that she was still paying down the original student loan debt she’d taken out 30-plus years earlier. My curiosity piqued, and I asked Monica if I could perform a review of her student loan debt. A week later, she handed me a large and overflowing manila folder containing 30 years’ worth of payments, loan documents, and servicer statements. I dove into it with passion. Monica attended a large public university outside New Jersey, graduating in the spring of 1987. In order to pay for tuition, housing, and other college costs, Monica obtained four (4) Federal Stafford FFEL loans for $2,500 each. All of the loans were fully subsidized. The Federal Family Education Loan program (FFEL) was a student loan program in which commercial bankers issued student loans directly to borrowers or colleges. FFEL loans are what the accounting industry calls “cash cows,” a type of business investment which rewards investors beyond risk (initial investment costs) with liberal guaranteed payments and profitability. FFEL loans are 100% guaranteed by the government, including subsidized interest rates, and administrative costs (special allowance payments). FFEL loans issued for qualified educational expenses began to earn interest from the date the loan was distributed to the borrower or school (date of origination). While the borrower is in college, interest accruing on subsidized FFEL loans is paid by the government directly to the lender. Since this interest is paid by the government, the borrower is only responsible for repaying the original principal balance upon graduation. The FFEL program was terminated by President Obama effective July 2010. Federal student loans are now issued directly by the government to borrowers (or colleges) and are a part of the Direct Loan program. Monica graduated from college in the spring of 1987. Once her six-month grace period expired, her FFEL loans entered repayment. Interest over loan term: $5,238.00. Over the next two years, Monica made consistent monthly payments of $127 directly to the commercial bank in New Jersey which originated the FFEL loans. November 1989; the commercial bank notified Monica that the servicing of her loans was being transferred to the Student Loan Servicing Center (SLSC), effective January 1990. The principal loan balance at the servicing transfer date was $8,706. The commercial bank reported student loan interest received for 1989 was $746.33. Despite working two jobs, full-time for a local nonprofit during the day and waitressing at the local bar at night, Monica had problems meeting her repayment obligations. She fell behind on the $127 monthly payments and approached her servicer for help. July 1991; Monica signed a new note with SLSC (replacing her original loan note) for 90 monthly payments of her loans at 9% interest. Her new monthly payments were $136. The principal at note date was $8,148 plus accrued interest of $368 (for periods when she was unable to make payments interest was still being charged). With the interest capitalized (added to principal), her new principal balance totaled $8,516 ($8,148 plus $368). Over the next three years, Monica continued to work at least two and sometimes three jobs. Despite her hard work, she still struggled to make her loan payments. During these years, Monica’s housing and transportation costs accounted for more than 50% of her income. She had very little left for discretionary purchases and the payment of student loan debt. November 1994; SLSC accelerated the loan due to nonpayment. The principal balance at acceleration was $7,325 plus accrued interest of $375. The interest was capitalized, bringing the principal balance to $7,700. Monica requested forbearance. Forbearance allows student loan debtors to pause their payments for a short period of time. While payments are not due, the interest on the loan generally continues to accrue. As a result, the balance due will be greater after forbearance. SLSC agreed to grant a six-month forbearance, giving Monica a little bit of breathing room. January 1995; Monica signed a new note with SLSC. Under the new deal, Monica would be required to pay 63 monthly payments of $154 at 9% interest. The principal of the note at signing was $7,325 plus accrued interest of $495, which came to a grand total of $7,820. Monica would begin payments in April 1995. Over the next two years Monica did her best to make payments each and every month. Cost of living and transportation increased, continuing to swallow more than half of her monthly income. Monica skipped or delayed payments on her $154 plan. August 1997 – ten years after graduation – Monica’s FFEL loans had been purchased by the NJ Higher Education Student Assistance Authority (NJHESAA). SLSC (the loan servicer) denied a request for economic hardship relief forbearance allowing the forbearance period to be interest free. Principal balance in August 1997 was $5,187. [The NJ Higher Education Student Assistance Authority is a State agency which administers NJ CLASS loans (private student loan debt* originated through the sale of bonds to investors) and, as investments, maintains large quantities of purchased FFEL loans in their portfolio. As of 6/30/17, NJHESAA’s FFEL-owned loans totaled almost $2 billion]. *The Federal Reserve categorizes any loan that is not a Title IV loan as private. Title IV refers to the Higher Education Act of 1965 and amendments. September 1997, after SLSC granted forbearance through April 1998, Monica signed another note with SLSC. The terms of the new note included 38 monthly payments of $173 at an interest rate of 9%. Principal balance was $5,187 plus accrued interest of $520 which was capitalized, bringing repayment of principal to $5,708. Payments were to begin May 1998. Over the next 2 years, Monica struggled to make the increased loan payments. Originally her monthly payment was $127 and a decade later, the monthly student loan commitment had jumped to $173. Working 60 hours a week, Monica’s yearly income rarely exceeded $25,000. In addition to struggling to keep up with the rising cost of living, Monica endured a series of medical catastrophes, fell behind on her payments, and defaulted in early 2000. NJHESSA told Monica she had to “rehabilitate” the loans. Default of federal loans occurs when payment has not been made (or acknowledged by the lender) for more than 270 calendar days. Default causes the loan to be subject to higher interest rates, collection, and late fees. Collection costs for Monica’s loans were 18.5%. A process where the borrower must bring the loans current by making consecutive monthly payments over no less than a 10-month period. Most often payments are determined by calculating 15% of borrower’s discretionary income, are not applied to the principal, and are used to pay for collection costs, fees, and interest. Late 2000; Monica enters the rehabilitation program. After a year, she was notified by the guarantor, NJHESAA (who owned the FFEL loans), her rehabilitation was completed, and the loans had been referred to Sallie Mae for servicing. Principal at completion of rehabilitation was $5,282 plus accrued interest of $338 plus collection and late/collection fees of $1,076 (both of which were capitalized) brought the new loan principal balance to $6,697. Monica signed a note with Sallie Mae for 104 monthly payments at $86. February 2003; Monica continued struggling to make payments on the latest note. She was still working on paying off medical debt and dental work. Housing and transportation costs exceeded 60% of income. She requested and was granted a forbearance of 12 months. Early 2004; Monica’s forbearance ends. Housing and transportation costs still accounted for more than 60% of Monica’s income, and she was still paying off medical debt. Adding to this burden, she encountered large veterinary bills for her dog. Monica could not keep up with the new payment plan and was delinquent. 2006; Monica contacted NJHESAA and requested to have her loans consolidated. She completed the Direct Loan Consolidation application complete with loan detail, personal information, and references and submitted it to the Direct Loan Consolidation center. If the loan consolidation were approved, Monica’s loans would only be subject to 8% interest. She received a postcard informing her that her application had been received on 06/22/2006. Loan balance at June 2006 was $9,436. 18 years after graduation, her principal balance was almost as much as the original loan amount of $10,000. There is no evidence her application for loan consolidation was ever processed and/or approved. If Monica’s loans had been consolidated, they would no longer be the cash cow FFEL-guaranteed loans were and may have been a deterrent to consolidation by the loan holders. February 2007; Monica was notified by NJHESAA that her loans had again defaulted. They threatened garnishment of her wages. Monica agreed to a voluntary repayment arrangement of $112 a month over a 10-month period which required direct deduction of the payments from her bank account. NJHESAA Form 1098-E for 2007 reported “defaulted FFELP loan” interest received of $972.87. March 2008: After completing the second rehabilitation** program of her loans and 20 years after graduating from college; Monica entered into another repayment agreement with loan servicer AES, agreeing to monthly loan payments of $95. [**According to studentaid.ed, prior to 2008, defaulted federal loans could only enter rehabilitation once. After receiving the notice from NJHESSA reporting her loans in default and threatening wage garnishment, Monica “volunteered” to make 12 monthly payments of $112]. NJHESAA Form 1098-E for 2008 reported “defaulted FFELP loan” interest received of $633.48. 2008 and 2010, Monica attempted to make monthly payments of $95. She was granted several periods of forbearance. In September 2010, AES notified Monica that her most recent forbearance had ended. NJHESAA Form 1098-E for 2009 reported “defaulted FFELP loan” interest received of $580.77. September 2010; Principal balance was $6,211, accrued interest of $1,000 (during forbearance) was capitalized, and resulted in new a principal balance of $7,209. Housing and transportation costs continued to hover around 55% to 65% of income. Old and new medical and dental bills exceeded $1,000. NJHESAA form 1099-E for 2010 reported “defaulted FFELP loan” interest received of $225.86. Monica’s income stabilized a bit, and she was able to make monthly payments of $95. January 2017; A statement issued by loan servicer AES reported principal balance at $3,208. January 2017 According to servicer statements and after thirty years after college graduation, Monica still owed over $3,000 on her original student loans. Along the way, she’d made over $24,000 in payments. The loans were not consolidated, although she tried to do so to lock in a lower interest rate. Her New Jersey refunds were levied for over a decade and seized by NJHESAA. Additionally, her tenant homestead rebates were also seized. Total amount of income tax refunds or homestead rebates taken by NJHESAA, exceeded $1,000. 3. Last to reduce principal. During forbearance; interest does not stop accruing when payments were not made and if payments are less than the amount to pay accrued interest, the principal balance increases. When a borrower is seeking forbearance for FFEL subsidized loans claiming economic hardship, application must be made and approved by the loan servicer. Monica made application for economic hardship in 2007 but it was denied by the servicer. Student loan borrowers should be aware of the daily interest cost of their loans. This is important because if payment is made for less than the daily amount, principal will never be reduced. At the beginning of Monica’s repayment journey in 1987, her daily interest cost on the 4 FFEL loans with a principal balance of $10,000 at 9% was $2.50 per day. She needed to pay at least $75 ($2.50 times 30 days) per month in order to satisfy the interest accrued and due before payment would be applied to principal. The daily interest rate decreases with each payment, assuming interest has first been fully satisfied. Federal student loans are exempt from most consumer protections (Fair Debt Collections Act, Truth in Lending, Statute of Limitations), are excluded, for the most part, from oversight by the Consumer Financial Protection Bureau, and are dischargeable in bankruptcy only under the most dire of circumstances (you have to meet the Brunner test proving harm and undue hardship). Collection costs are punitive, enormous, and add to the principal. Like most students entering college right after high school, Monica was a teenager when she signed her student loan contracts. It is apparent she had no idea what kind of indenture she’d “agreed to.” This can be said for the majority of student loan borrowers. Financial education at the high school level is seriously lacking, if existent at all. Student loans are originated between borrower (student) and lender without much scrutiny, oversight, awareness, or repayment considerations. Politicians in Congress made this possible. Over the past decade, through both pro bono and paid tax preparation work; I’ve seen many student loan borrowers like Monica struggle to make ends meet and have tried to understand what is happening with their student loans. I’ve watched as refundable credits in the thousands of dollars have been seized by federal and state agencies year after year to pay for student loan debt. Many low-income taxpayers who took out debt decades ago and who have tried to pay this debt back, find – with accrued interest and collection fees – they owe much more than the original loan amount. Those who qualify for tax credits earned for dependents, education, or economic qualifications (refundable child tax credit, education, and earned income tax credits), never see the refunds which could have helped with housing, utilities, and child care. Instead the money is siphoned off into a vat of pots to pay for bloated collection costs, fees, interest, and most likely never touching principal. It is a cycle that can last decades, is rarely broken, and often without any reconciliation of seized funds. This past tax season I prepared the return for an 80-year-old man who came into the tax clinic. He handed me his W-2 form which reported wages of $500 and a Social Security statement. He needed to file a tax return to obtain a refund of federal and state withholding reported on the W-2. While reviewing his Social Security statement, I noticed one-third of it was garnished. When I questioned him about this, he became very solemn, put his head down, and explained it was for an education loan taken out for his daughter “some time ago” to help her attend college. She had since died. Piecing together what he told me, I figured he took out a federal Parent Plus loan, had defaulted (before, during, or after his daughter’s illness and death) and didn’t know what to do. The default resulted in the garnishment of his Social Security, most likely without end for the rest of his life. There isn’t even an accounting of what is taken each year. Without basic consumer protections, financial education, understanding, or advocacy, and absent the ability to discharge in bankruptcy, the contracts Monica and other borrowers enter to secure loans to help fund higher education are heavily lopsided in favor of lenders, investors, and loan servicers. I question, as required by the basic principles of contract law, whether there is even a meeting of the minds between borrower and lender. Additionally, there seems to be some amount of unconscionable favor on behalf of one party over the other. Student loan debt has topped $1.3 Trillion. By entering into these cumbersome, confusing, complicated, non-transparent contracts, the US has been devouring its citizens- young and – old in a cruel system of endless servitude. Guest Author: Alan Collinge, StudentLoanJustice.Org,Both Alan and I have written various posts on the student loan crisis. Alan has been featured on Angry Bear Blog from time to time. If you are in college and looking for something worthy to fight for today; as a student, you should consider the student loan issue. Student loans and how they are administered are the national injustice of our time reaching threatening proportions and impacting the livelihood of young adults going forward. While at first glance, the problem appears complicated, confusing, and overwhelming; it is actually quite simple and its debt genesis hearkens back to the creation of this country. This problem transcends partisan and cultural divides and could serve to bring together those on the left and right on campus. When the Founders created the Constitution, they made it a point to reflect on bankruptcy rights prominently. Few people realize that a uniform bankruptcy system is called for before the power to raise an army or a navy, ahead of the power to coin currency, and even ahead of the power to declare war in Article I, Section 8 of the Constitution. Obviously, bankruptcy rights were very important to these men. Free men are not forced into any type of behavior by the government that We The People established and ordained. The government is to serve the people – not to force them into servitude and obedience. The people are sovereign, as the people came before the government and the Constitution that gave rise to the government. Adam Smith, the founder of free market economics provided the basis for western economic theory, was compelled to advocate for bankruptcy protection as a means to encourage entrepreneurship, risk taking, and also a means to compel good faith in a lending relationship. When an individual or firm goes bankrupt, a legal process is instigated to discharge debts that cannot be repaid. In former times such debtors might have been put into a debtors’ prison and languished there for years. The process weighs assets against liabilities and allows the debts to be discharged at some fraction of their nominal value, leaving the debtor free of the burden, albeit subject to rules of financial behaviour and with a blemish on their credit record which can last for years. Today, student loans are the only type of loan in this country from which bankruptcy rights have been removed leading to consequences so severe as to result in a form of peonage. Despite peonage being made illegal after the civil war in 1867, it still flourished in the form of sharecropping with former slaves and poor farmers farming plots of land owned by others. Sharecroppers supposedly received a percentage of the profits from sale of grown crops. The sharecroppers were forced to take out relatively large loans just to get by and meet daily expenses, buy seed, rent land, and pay the interest rates imposed on them by landlords. Also in the past African Americans could be accused of falsely owing money or trivial sums, given sham trials and quickly sold off by the courts into a privatized system of debt slavery to pay back debt. The peonage contracts contained enslaving terms and conditions, allowing the employer to trade, confine, whip and beat workers as long as the debt was deemed unpaid, which could practically last forever. While not as severe as peonage, students in default are denied access to federal programs and unemployment benefits. Social Security and employment wages can be garnished leading to diminished lifetime earnings and poverty. All of these conditions have a severe impact upon the overall economy as younger workers do not achieve their full earning potential. The student loan industry is willfully predatory and profitable for the banks who lobbied intensely for the removal of bankruptcy protections and work hard to keep their monetary advantage. As Mr. Potter would say; “The bank always get paid” and this comes no matter what the terms or conditions of the loan are. (run75441) In my own discussion with a former University of Michigan lobbyist who was regaling me after I dared to make a statement to Michigan Senator Debbie Stabenow about what her stance and actions were with regard to student loans. “There is IBR and Repaye which are programs allowing payment back on student loans based upon income.” These programs are mostly failing because of one rule requiring the yearly application to the program rather than an automatic re-up into the program. The re-up is required to report income a factor which is automatically done for Medicare via computer systems. The manual yearly application for the programs was bound to be a failure just by this alone. It was not just the banks cashing in on the removal of consumer protections. 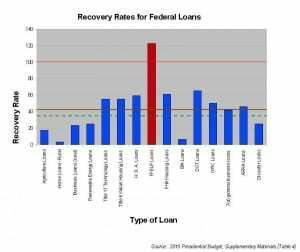 In 2012, the federal government booked over $50 billion in profit on the lending system and this has increased in more recent years. What is disturbing is White House Budget data showing a profit being made on defaults. Think about this: where a credit card company is thrilled to get back a dime on the dollar for their defaulted accounts; the federal government is actually getting back more than a dollar in return. This is a defining hallmark of a predatory lending system and unfortunately for the students, the Department of Education sits on top of it all doing everything it can to perpetuate this situation. Department of Education lawyers fight tooth-and-nail behind the scenes to deny legitimate bankruptcy. This form of government enforced peonage spans many presidents and Congresses and both political parties going back to the seventies. In 1998, when Congress made bankruptcy permanently unavailable for the overwhelming majority of borrowers, the nation owed roughly $100 Billion in student loans. Today that has exploded to $1.5 Trillion. By the end of this year, nearly one in four borrowers will have defaulted on their loans. People’s lives are being devastated. Families are being torn apart, particularly where cosigners are put on the hook for their kid’s exploded loans. People are fleeing the country, and some are even committing suicide as a result of their student loan debt. If you think you don’t need to worry because there are forgiveness programs in place, you are wrong. With 57% already kicked out of them income based repayment programs are failing misrably. Assuming the programs are not ended by Secretary of Education Betsy DeVos, I estimate only 10% will be successful and have their loans forgiven and still potentially taxed as income. The rest will be disqualified from the program and left owing far more than when they graduated. Alan Collinge is the Founder of Student Loan Justice Org and author of “The Student Loan Scam” (Beacon Press). Allan Collinge is the founder of the Student Loan Justice Organization a grassroots citizen’s organization dedicated to returning standard consumer protections to student loans. The group was started in March of 2005 and has focused primarily on research, media outreach, and grassroots lobbying initiatives. located in Washington DC. From time to time Angry Bear has publicized Allan efforts to restore bankruptcy protection for student loan. In a rare display of political courage and bipartisanship last week, Rep. John Katko (R-NY) filed the Discharge Student Loans in Bankruptcy Act with Rep. John Delaney (D-MD). This bill will return standard bankruptcy protections to all federal and private student loans. Katko is well ahead of the conservative curve on this issue and has a unique opportunity to revitalize the Republican Party in the current session by stepping up to lead the fight on this issue. President Obama federalized the student loan system during his eight years in office and the nation’s student debt tab increased by $1 trillion. From these student loans, the federal government profits well over $50 billion annually from the student loan program, and also makes a profit on defaulted student loans. This is something no other lender of any loan in this country can claim. In fact, this is a defining hallmark of a predatory lending system. During the same time period, the price of college rose far faster than any other commodity, including healthcare, and this trend is continuing to accelerate today. The student loan program is a structurally predatory lending system and Uncle Sam sits atop the hornet’s nest. What has caused this hyper-inflationary lending behemoth and its consequences is the fact that the Department of Education is not constrained by standard free-market protections like bankruptcy rights, statutes of limitations, and other standard protections existing for every other type of loan. Congress stripped these protections from student loans and in the end greatly destabilized the entire loan system. Make no mistake: The Department of Education loves this freedom from free-market protections and fights tooth and nail behind the scenes to keep bankruptcy gone from its source of income. Since Trump was elected, the student loan swamp of unelected bureaucrats in and around the Department of Education have made bold moves to make this lending system harsher and more profitable. Some true conservatives have noticed this problem and have begun to speak out. Jeb Bush, for example, put the return of bankruptcy protections to student loans as a plank in his presidential platform. Pundits and think tanks such as David Brooks and the Cato Institute have also publicly called for the return of bankruptcy protections to student loans. The issue screams out to conservatives for justice by sponsoring the Discharge Student Loans in Bankruptcy Act. By his actions, Congressman Katko is demonstrating to his colleagues that it’s fine, in fact,it is a great political benefit to stand up for the citizens, fight for free-market mechanisms, and against big government. Sponsoring this bill will endear Katko to tens of thousands of Democratic voters who would have otherwise voted against him next year. There are roughly 100,000 people in his district with student loans, of which 63,000 are currently unable to pay down their loans. While few of these voters would ultimately file for bankruptcy, all of them feel the predatory weight of the lending system on their backs, and all will appreciate having this constitutionally mandated power back on their side. I suspect that a large majority of these voters — regardless of party — will be strongly compelled to vote for him based upon this issue alone because it is that strongly held by these borrowers. What is most interesting is that even if his Democratic challengers’ parrot Katko on this issue, his being a Republican makes the chances for success of the bill go up dramatically. No Democrat with the same position can claim this, and indeed we have seen similar Democrat bills flounder and fail in years past. This is one of the hottest issues today in Congress and Congressman Katko is in the forefront of it with his bill. Other Republicans in Congress could benefit and capitalize on it to reduce the strong headwinds from Democrats in next year’s election. Republicans could do well in supporting this bill and avoid a crushing defeat. In July, the former Rector at the University of Virginia, Helen Dragas, accused the school of having created a $2.3 Billion “slush fund” during a period when the university had raised tuition on students by 74%, and cut grant aid to poor students. While this is an astounding story in itself, the fact of the matter is that there is much, much more to this story than meets the eye. In 2013, it was discovered the University of Wisconsin had similarly amassed between $400 million and $1 Billion in reserves, built largely from excess tuition income. Members of the state legislature, furious that the college had been stockpiling cash while using stories about their dire financial straits to convince the state to allow them to raise their tuition, actually demanded that the president of the university resign. However, the president ultimately was able to hang on to his job by using, essentially, a“but everyone’s doing it” defense. The university compiled a list of similar cash stockpiles their peer institutions had accumulated, roughly during the same time. As the table below shows, the numbers are staggering. While the University of Wisconsin had built up assets exceeding $1 Billion, they were correct about their peer institutions engaging in similar hoarding activities and some to a far greater degree. The University of Texas, for example, had amassed $9.5 Billion in restricted assets, and another $3.5 Billion in unrestricted assets. The University of Michigan had stockpiled $3.3 Billion in restricted assets and $2.5 Billion in unrestricted assets. Even relatively small, private schools like Temple University had managed to squirrel away billions in expendable assets! A couple of years ago, I was at a meeting where the president of a smallish community college in central Illinois bragged that the school had managed to amass some $80 million in reserves. I held my tongue at the time; but, the time for silence on this issue is over. These revelations scream out for further scrutiny. If ever there were a worthy subject for investigative journalist teams to examine, the growth of college/university slush funds is ready for sunlight. 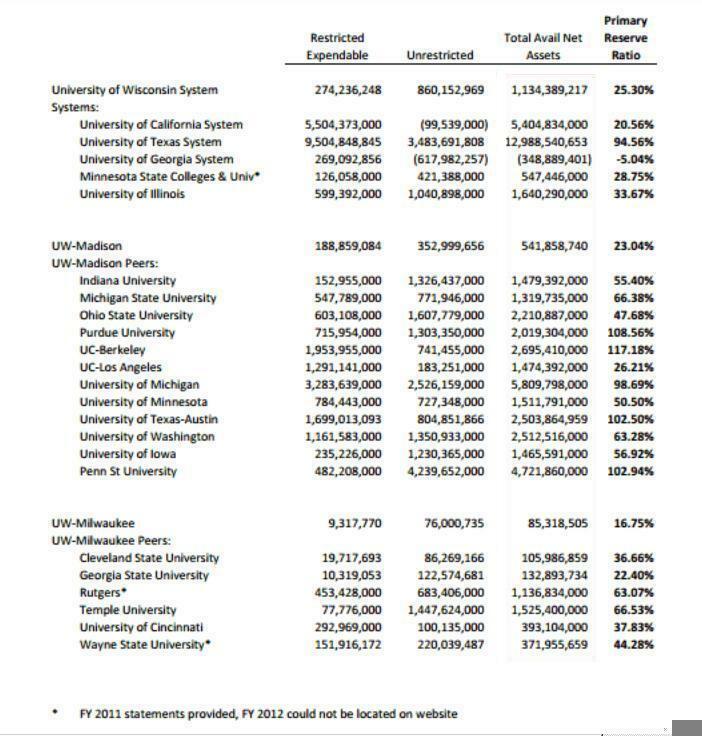 Remember, these mountains of cash are over and above the endowments of these schools and only came into being over the past ten years. The universities are claiming that this is prudent fiscal management, but the facts of the matter speak for themselves. These pots of money barely existed ten years ago. Now they are everywhere and they are everywhere HUGE. If these numbers are at all representative of Academia broadly, it is quite safe to say that the cumulative total of these stockpiles could easily exceed the combined value of all college endowments (about $630 billion), and could even match the size of all student loan debt in this country (roughly $1.4 Trillion). Colleges and universities in this country have raised their tuition at record rates over the past ten years. All have also given administrative staff massive increases in pay, and most have undertaken massive capital improvement projects. They justified their tuition hikes by citing state cuts in funding. This is a complete fiction. In fact (but for a slight dip in the wake of the financial crisis of 2008), the states have consistently increased their funding to colleges, in real dollars, roughly with the rate of inflation. 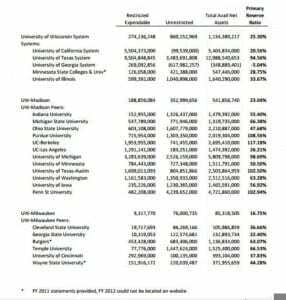 These cuts the colleges claim to have happened, never happened and are really only college officials pointing to the fact that the states “slice of the budget pie” is now smaller due to the colleges skyrocketing operating budgets. This blatant dis-ingenuity of the higher education complex must end. While Helen Dragas is undoubtedly being vilified by her colleagues, she should be given a medal for demonstrating that at least one college official as the moral compass to point to what is obviously wrong, and demand that the universities be held accountable for their greed, and their gross neglect of the community purpose that they claim to serve. run75441: The slush fund build is going on at the same time cuts in funding for minority and low income students is occurring. Much of the funding for tuition for lower income and minority students is going to higher income students. Alan Collinge is Founder of StudentLoanJustice.Org, and author of The Student Loan Scam (Beacon Press). Alan Collinge has been featured at Angry Bear over the years. US Federal Marshals Picking Up Student Loan Defaulters . . .
Alan Collinge of the Student Loan Justice Org sent me an email yesterday. Bad Stuff from Texas . . . This is a scary story. They are arresting people en masse in Texas over student loan debt. There’s no direct tie-in with the for-profit prison thing, but for some reason the one reminds me of the other!!! Anyhow, I hope all is well on your end! The sum we are talking about here is $1500 before collection agency fees and the costs of federal Marshals contacting the debtor and dragging Paul Akers away to jail. What the WP’s Michelle Singletary misses in this is the case is in federal court with federal Marshals dispatched to pick up Mr. Akers for a debt of $1500. If this is not unusual to the WP columnist as she notes, it is highly unusual to me and I too have been involved with student loans for years. So what gives? 29th District Texas Congressman Gene Green: “the federal government has been contracting out student-loan collections to private debt collectors, who are allowed to deploy the U.S. marshals as their enforcement arm. This appears to be over reach by the US Department of Education if this is really happening; but a closer look revealed, judges are going after people who do not show up in court. You can be held in contempt for this and also if the judge believes you are deliberately failing to pay. Both occurrences will get you a place in prison. The bigger question is why does a private collection agency get to use federal court and federal marshals to collect $1500? And yes I already know the US Department of Education is a federal being. Even so, seven armed US Marshals? What if the Justice Department treated bankers and investment firm gamblers in a similar manner? Something is awry when the US Department of Education allows debt collectors to resort to Federal Court (which already has a lack of Federal judges due to Republican legislators blocking Pres. Obama nominations). I wonder how this will play into the gov., the pres., the Koch Bros, CAP and other supposedly lib and prog. think tanks wanting to let prisoners out of prisons due to harsh sentencing. But wait a minute, these are past and present students and they do not count. There is so much wrong here, it is difficult to know where to begin. 29th District Texas Congressman Gene Green says more to come as the US Dept. 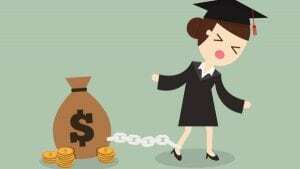 of Education cracks down on student loan defaulters in Texas (for now). “Our reliable source with the US Marshals in Houston say Aker isn’t the first and won’t be the last. This just goes to confirm my belief of the present effort by the Koch Bros, CAP and other liberal think tanks in addition to the conservative/libertarian think tanks on changing sentencing guidelines and releasing thousands from prison due to harsh sentencing. This has nothing to do with having sympathy for those caught up in preordained sentencing guidelines for repeat offenders and druggies as much as it has to do with changing the law to keep corporate management out of jail for violating EPA laws, banking laws, etc. In this instance, the ploy is to shift “mens rea” on to the prosecution alleviating the need of corporations having to prove they and their management did not know the law (in such cases you ask for jury trials now). We are again being hoodwinked by the Koch Bros who wish to piggy back this shift on present legislation sponsored in part by Congressman John Conyers who sees African Americans getting out of prison now incarcerated due to harsh sentencing guidelines. A noble effort; but, it should not give Corporate America and its heads a free get-out-of-jail card. We will stick it to present and former students who typically have little money to pay back aggressively formatted loans, fight back against debt collectors in court, and send multiples of federal marshals to their homes to drag them to court while giving heads of Corporate America a lenient alternative. Who thought of this??? This is not the first time Phoenix-U has been in trouble. In 2013 the University of Phoenix was threatened with probation by the accreditation board for a lack of “‘autonomy’ from its corporate parent -– a development that prevented the university from achieving its ‘mission and successful operation. '” In other words, the for-profit university #1 priority by its owners was to turn a profit at the expense of teaching, retaining, and graduating its students. This is precisely what I had alluded to previously on higher rates of defaults. As I mentioned above, a large percentage of those who defaulted had student loan debt of less than $10,000. 34% of those borrowers in that group who defaulted on their student loans had balances of less than $5,000. 21% of the 2009 cohort were in this category of < $5,000 in student loans five years out which depicts a worsening trend when compared. A closer examination of the 34% also reveals this group to be made up of students who attended community college, did not finish, perhaps discovered this is not what they wanted to do, or the curriculum did not fit their needs. What the NY Fed concludes is the default rate worsens when a much longer period of time is taken into consideration as opposed to the 3 year window the Department of Education looks at and which the public hears about in the news. The longer the period, the higher the default and it continues through years 4 through nine for the first two cohorts. 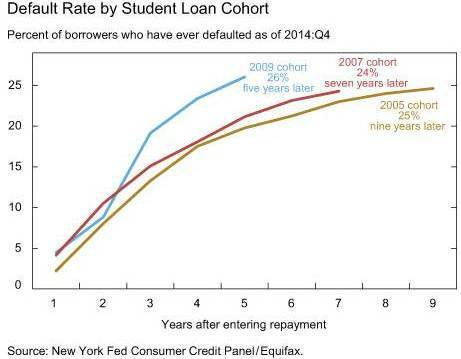 As shown the default rate for the 2009 cohort is already higher. Those who had lower amounts of student debt in the end may have defaulted due to a worsening economy or potentially did not get the payback expected from a two year degree at a community college or for-profit school. The study also revealed those who are current today with their student loans did experience stress in making payments and 63% of those student loan borrowers appear to have avoided delinquency and default over the last decade. On the other side of the coin, student loan borrowers with $100,000 of debt had a default rate of 18% which has been attributed to their being higher earners after graduation. 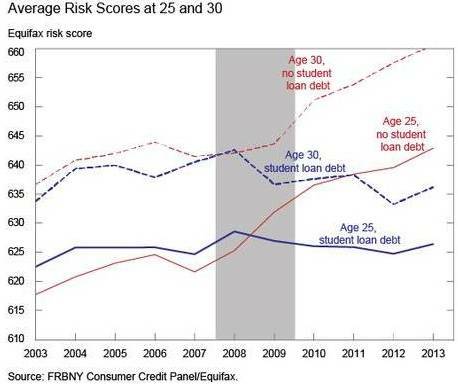 Using the same data, the NY Fed reviewed the risk rates of 25 and 30 year olds with and without student loan debt. 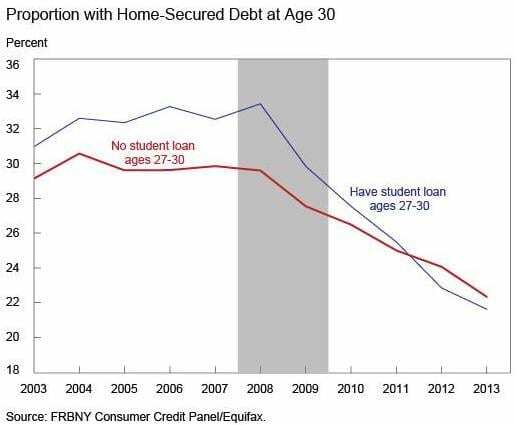 As can be expected, those households with student loan debt were deemed a higher risk due to student loan balances and higher interest rates and a decrease of potential income over time. 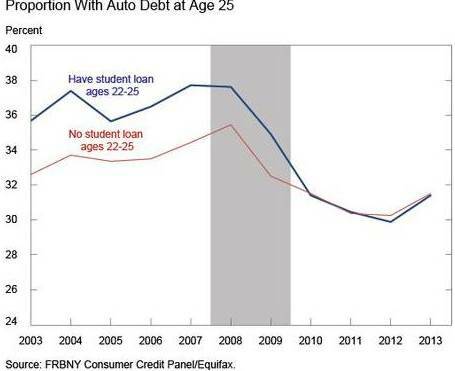 Those students would be less likely to obtain a loan or a loan with lower interest rates. A higher interest rate adds to an already high financial burden.